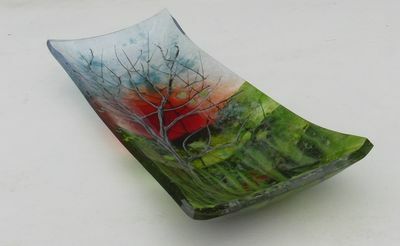 These are examples of Kathryn Webley's canal inspired fused glass light covers. The light covers are made to order. Covers in one of Kathryn's designs are priced at £105 for a flat style or £150 for a curved cover, alternatively you can commission Kathryn to make a cover in a bespoke design. They are designed for use with LED lighting and the curved style uses brackets made by the blacksmith at 'The Forge' in Worksop. Do get in touch if you are interested in these unique light covers for your home or boat.